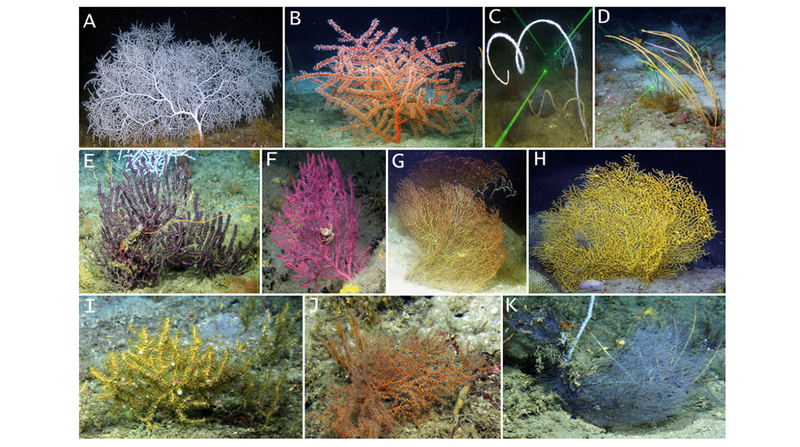 In the Gulf of Mexico, mesophotic coral ecosystems (MCEs) exist at depths of 30-100 meters. These ecosystems are home to light dependent (corals with photosynthetic algae living in their tissues) and light independent corals (those that feed on plankton and detritus floating by in the water) and can host a diverse number of invertebrates and fish species. Currently, there are 4 known areas where mesophotic coral ecosystems exist - these are Pinnacles Reefs, Flower Garden Banks, Florida Middle Ground reef system and Pulley Ridge. Beyond these four regions, potential MCE habitat is poorly known. There are 179,000 square kilometers of suitable habitat in the Northern Gulf of Mexico that could potentially support MCEs. The Deepwater Horizon (DWH) accident in 2010 impacted existing and potential MCEs in the Gulf. Exposure to oil and dispersant has been found to produce a decline in deep sea coral health, and corals in MCEs were found to be injured in a similar manner to their deep sea relatives. Injuries were caused by exposure to surface oil, dispersants and soot from burning of surface oil. ECOGIG researchers wanted to determine suitable habitat for mesophotic corals in the Gulf of Mexico - in particular octocorals and antipatharian corals (black corals that are tree-like in appearance). The authors of this paper used photo surveys of corals that were collected over three consecutive years (1997-1999) as baseline data of coral conditions prior to the DWH accident. They supplemented this with presence data from the 2014 NRDA survey. In total, 1975 photo records were used to construct a presence database, from which a computer model was compiled. Thirty-two environmental variables were considered to build the model and test for factors that were significant in coral presence. The results of the modeling showed that there is approximately 405 square kilometers of suitable habitat for corals between Mississippi and Florida. The results also showed that mesophotic corals prefer small and tall carbonate mounds, with a high preference for reef tops and slopes - these high grounds mean the presence of currents, which give corals better access to nutrients, oxygen and food, while also reducing sediment deposition on the corals. They like to be near hard grounds, with a small amout of fine sediment. They prefer areas with currents that are downwelling, with a moderate east and north current - currents are a major contributor to suitable habitat for corals who feed on plankton and detritus floating by in the water. The goal of this study was better understand the suitable habitat for mesophotic coral reefs. The maps generated by the models will help serve as a baseline for future exploration in the region in order to verify the true extent of MCEs in the Gulf. This will help to inform future restoration and conservation strategies for MCEs that could be impacted by natural (heat stress, hurricanes) or human cuased (oil spills, eutrophication, ocean acidification) events. You can find the entire research paper online here.